When your user account is created, you receive an automated email message that contains your organization name, your user name, and a link to set your password. You must create a password before you can log in to Dentrix Ascend. Important: You must set up the password within 24 hours of receiving the email message. If 24 hours pass before you set up a password, contact Customer Support at 1-800-734-5561 to have a representative resend the email. In the email message that was sent to you when your user account was created, click (or tap) the Set your password link. The Dentrix Ascend website opens to the Set your password page. 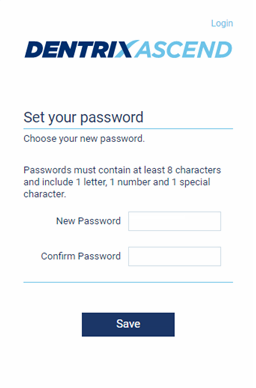 Type your new password in the New Password and Confirm Password boxes. The password is masked with dots as you type. Important: Passwords must be at least eight characters in length and include at least one letter, one number, and one special character (for example, #, $, &, and %). Passwords are case-sensitive. Login should be restricted by time or location so that certain staff members can't login from off site unless authorized. I posted this request on the "Feature Request" forum for you. Thank you for helping us make Dentrix Ascend better.